Please note that there are 2 prep classes conducted in September that will set you up for an enjoyable and successful experience (see those classes for details). Once you register for the BOM and pay your $25 fee, you will be automatically enrolled in those 2 classes and do not need to sign up. Learn how to make this stunning quilt ~ Flower Dance, an embroidery machine block-of-the-month pattern series by Smith Street Designs. 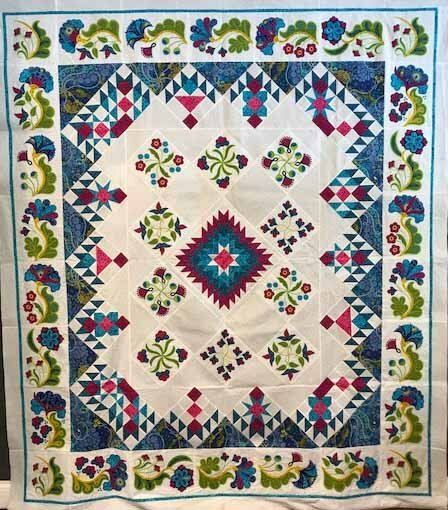 The full-size Flower Dance quilt (84” x 96”) has one pieced center medallion surrounded by 36 machine-embroidered applique blocks, 18 pieced blocks, and a pieced border. The pattern series contains instructions, embroidery design files, and electronic cutting files for multiple different quilts and other projects such as pillows, placemats, and wall hangings created from the Flower Dance designs. Each month has different additional projects that you will learn about. You must have an embroidery machine (or access to one to take this class) that will accommodate a 9" x 9" hoop. *If you would like to rent one of our classroom machines for this class please let us know when you sign up, as there is a lot of homework and will require multiple rental days to complete your quilt. Class format for Flower Dance Block of the Month will be a lecture/demonstration to prepare you to do your work at home between meetings. Each month, additional embroidery stitch-out instructions for the monthly patterns along with cutting and piecing procedures for the pieced blocks will be provided. Hints and tips will be shared. Enrollment preference will be given to students taking all six Flower Dance Block of the Month sessions. A supply list will be available August 1st. If you do not have an electronic cutting machine, Cut Up and Sew Silhouette Cameos® will be available for use in the store by students signed up for the class. *Single session enrollment is available for each month for a fee of $15.00 plus purchase of CD/Pattern for that month. This fee does not include the use of the Silhouette Cameo machines. Materials Included: Entire Flower Dance BOM Kit and classes. Requirements: Must own an embroidery machine with at least a 9" by 9" hoop.